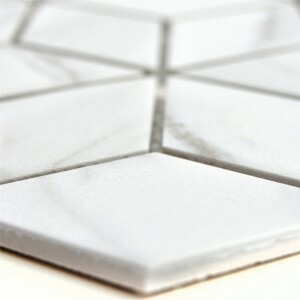 The ceramic mosaic tiles or wall tiles Zyrus Carrara are available in the following shapes: Square 48. Square 73, Dice, Hexagon 95 and Hexagon 51. With so many shapes, there is certainly something for every taste. The color of these mosaic tiles or wall tiles is the same in all forms. 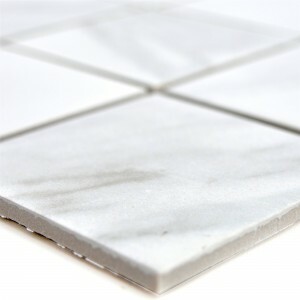 These are available as the name suggests only in Carrara white. The size of the stone is 48 for the shape and 48x48mm for the cube shape. The stone size of the form square 73 is 73x73mm. 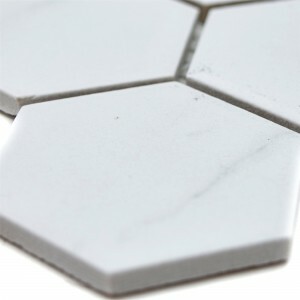 The stone size of the shape Hexagon 95 is 95x110mm and that of the shape Hexagon 51 is 51x59mm. 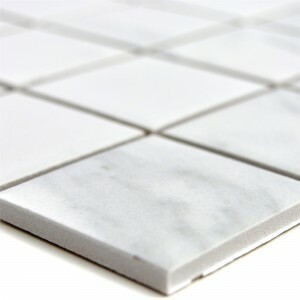 All forms have a matt surface, are made of ceramic and are produced in a thickness of 6 - 6.5 mm. The size of the matte square 48 is 30,6x30,6cm. The area of a mat is 0.093m². The shape square 73 has the same mat measure, but covers an area of 0.094m ². The mat measure of the cube shape is 26,6x30,5cm and a mat corresponds to an area of 0,081m². The mesh size of the Hexagon 95 is 25.6x29.6cm, which corresponds to an area of 0.076m². And last but not least the shape Hexagon 51. Here the mat size is 32,5x28,1cm, which corresponds to an area of 0,092m². 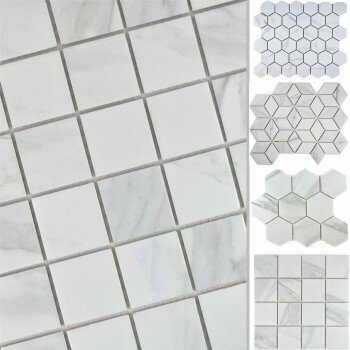 Carrara White is a very popular color for mosaic tiles or wall tiles. 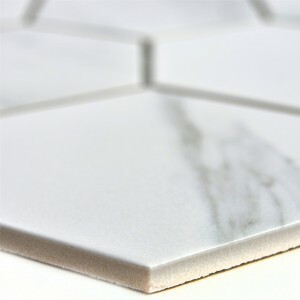 These tiles not only give you an excellent look, but another advantage. They are relatively easy to clean. In addition, you have the choice between five different shapes, there is certainly something for your taste.